My father was born in Rugby, Warwickshire on the 9th May 1913 and was named Arthur Raymond Woolgar. He was always known as Ray when he left school. He worked as a garage hand and later decided to join the Royal marines and enlisted in 1931 for 12 years. My father and mother married in 1935. He was based at Plymouth and he served on several ships these included HMS Rodney, HMS Galatea and the Aircraft Carrier, HMS Implacable. 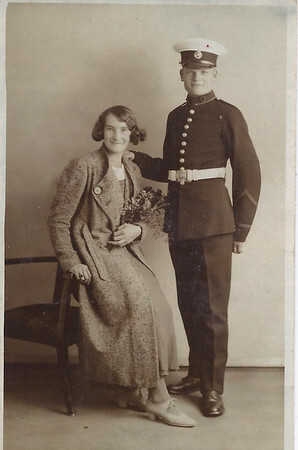 Whilst serving on the Implacable, my mother, brother and I did not see him for 2 ½ years as the war was on. He went away in May 1944 and returned December 1946. To me and my brother he was a stranger. At another time, he had worked on the searchlights in Portsmouth (Eastney perhaps) but being a child myself, I only learnt this this from my mother. He worked his way up the ladder and when he left the Royal Marines in 1952, he was a Quarter Master Sergeant. At one time when he was in the Marines (I think he was on the Implacable at the time) he said that they brought home the Englishmen who had been Japanese Prisoners of War but he would not talk about this as he said that what he saw was horrifying. I do wish I had asked him more. During this time (from when my Dad joined up) we lived in Plymouth for a while and moved to Southsea because Dad was then stationed at Eastney. I then caught Diphtheria at 2 ½ years old and my parents were told it would be better if we went to Hayling Island as the fresh sea air would be better for me. 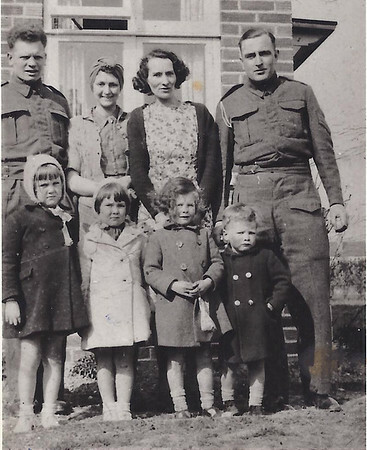 As the war was still on, my parents got rabbits and chickens as the food was rationed and it meant we would have eggs. Dad would sometimes kill a rabbit or chicken to provide meat for a meal. 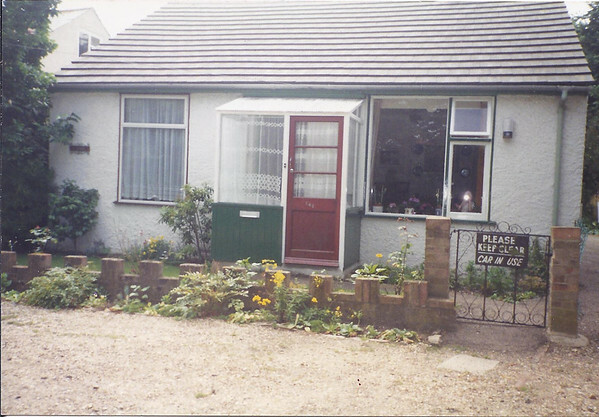 We lived in a bungalow in the Sea Front Estate. All the bungalows, which were for the well-off as holiday homes, were taken over by the Services so that servicemen’s families could live there, as all the children’s fathers were serving in the war. Sea Front estate during the war. Back row, Dad (left), Mum (3rd from left). Front row, me (3rd from left) and my brother Rob (right). I can remember American and Canadian servicemen sleeping under trees on the estate and they gave us children lots of sweets (as sweets were rationed) and one day, we got up and they had all gone. It was only as I got older that I realised they had gone over to France for D-Day. Us children went without a lot of things during the war years but, being born at the start of the war, I knew no difference. We never tasted a banana for years, if you had an ice cream you could not believe how nice it tasted. Tinned fruit, dried fruit, all food was a luxury. Luckily Mum only had two children to feed when Dad was away. If there was an air raid and Dad was home, he would carry me and Mum would carry my brother to the air raid shelter that we shared with neighbours. You could hear bombs dropping and boys next day would be looking for shrapnel to collect. The air raid shelters would be damp and smell musty. We did have a Morrison shelter in the bedroom. It was like getting into a cage but it helped to protect you if the ceiling collapsed through a bomb blast. It must have been awful living during the war years but as we were born at the start of the war, us children thought nothing of it. When the war ended there was a big party on the green of Sea Front Estate for all of us children. Most of our fathers were still away. 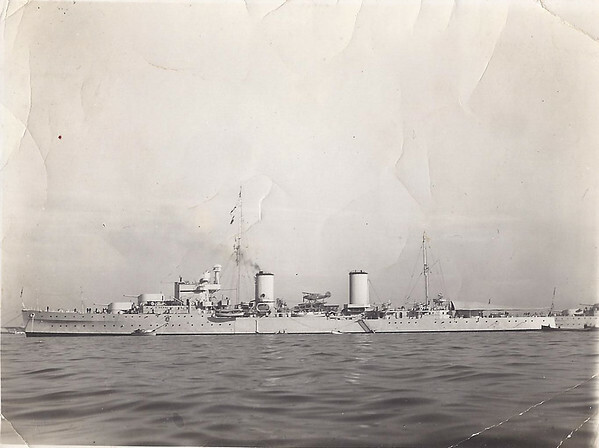 Dad must have come back home on the ‘Implacable’ as it was 1946 (I was 8 years old) and if I remember rightly, it docked in Scotland and me, mum and my brother were there to welcome him back but, to me and my brother he was a stranger as we had not seen him for 2 ½ years. We went on board the ship and were taken down from the flight deck to the plane hangar to find big white plates with tinned fruit on, something we could not remember ever having. I love tinned fruit to this day. It must have been awful for dad having his children treat him as a stranger. In 1952 dad came out of the Marines and by then we had moved to Kings Road where a council estate had been built (we moved in 1948). Most of the families that lived on the Sea Front Estate also moved to the new council estate, right near to the school we went to. There was only one school on Hayling and it is still there and being used. My father got work on British Railways after he was demobbed and his first job was on the road toll gate at Langstone. As far as I can remember, it cost ½ d to walk across and 1d to cycle it. I am not sure what cars had to pay but in those days there were very few cars. When he was on duty on a Sunday, I had to cycle from Kings Road to the bridge and take him his roast dinner in a casserole dish. Later, the road bridge was decaying and could only take a certain amount of weight, this meant that passengers would have to leave the bus and walk across the bridge before getting on again. (I think this was about 1954). This wasn’t very nice if it was raining and windy as there was no protection and by the time you got over the other side you would be soaking wet and cold. A new bridge was built and as there was no toll gate, my father was found work on Bedhampton Level Crossing and I think sometimes he worked on Havant and Bedhampton Stations. He then got promotion as a Porter, Ticket collector and selling tickets in the ticket office on Hayling Station, West Town. This was shift work. The BBC, years ago when it was black and white TVs, broadcast what must have been the first TV soap opera (as they now call them) called the Grove Family and in one episode it shows them discussing their holiday which happened to be on Hayling Island and dad appeared in this as it shows the Grove family getting off the ‘Billy’ and dad had to take their luggage from the luggage van, place it on a trolley and wheel it to a taxi that was outside of the station. Dad had to pretend the suitcases were heavy when they were empty. He was paid £5 which was worth having in those days. We were so excited that our father had been on TV. My father really enjoyed working at Hayling Station as he met so many people and he was a very friendly man anyway. In his spare time he liked gardening and grew all the vegetables needed at home. He also rented a plot of land near to where we lived and reared chickens which he would fatten up for Christmas and a local butcher would buy them off dad to sell on to his customers. We also always had a good supply of eggs and what mum did not need, he would sell to neighbours. A few years later, my parents bought a small bungalow at Whites Corner and from their kitchen window you could see the Hayling Billy go by. In the summer, the Billy would be packed with day trippers and holiday makers complete with their buckets and spades. In the summer, if you were near enough to the station, it was a quicker way of getting off the island as by car it could take 2 hours or more as the traffic would get held up at the Langstone crossing when the gates were shut. If we were at Hayling Station, 1960-61, when the Billy was in, my eldest son Michael (he was only 2 ½ -3 years old) would be lifted up to the footplate by one of the crew and they would give him a ride when moving the engine for its return to Havant. My parents’ retirement bungalow at Whites Corner. Dad also worked on Hayling Station with Alf Ripsher (also an ex-marine). 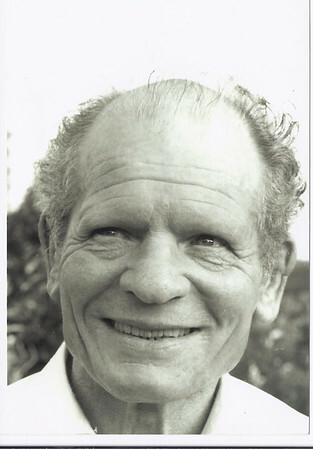 Alf and his wife Flo were also great friends of mum and dad and had been neighbours at both the Sea Front Estate and Kings Road. Sadly, Hayling station was closed in 1963. I still have the whistle dad used for the trains and also a signal paper (which I saved from the ticket office on the closure day). This gave the bell codes used to contact the staff on the line. Parcels office 2-3 rings; Havant signal box 1 long ring; Langstone gate crossing 3 rings; Langstone bridge 4 rings; Hayling signal box 1-2 rings. This is still in the original wooden frame. I also have two train tickets issued on the day Hayling station closed. My father was transferred to Havant station and was clerk to the station master, Mathew Lamport, until his retirement in 1978. Front row: Havant Station Master Matthew Lamport, my Dad (Ray Woolgar) and my Mum (Hilda Woolgar). 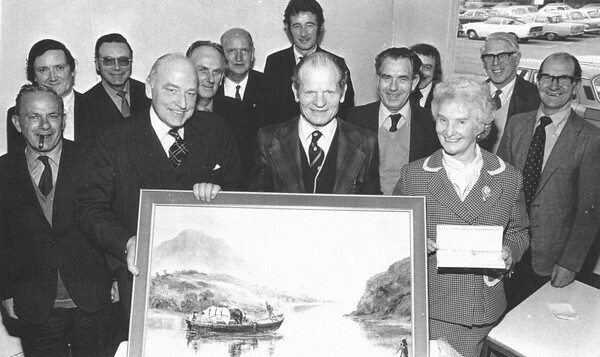 My Dad was presented with the painting at his retirement ceremony at Woking. Until recently, I thought the painting no longer existed until Michael, my eldest son, said it was hanging in the Fareham Leisure Centre (where he works). It is nic to know that it still survives 34 years later. When Dad retired, he spent a lot of time in the garden growing all the vegetables they needed and Mum did the flower borders. Their garden was always so neat and tidy. Mum made home-made wine which my father liked to drink. Elderberry, Sloe, Dandelion, Gooseberry and many more. All of these fruits were freshly picked and I must say that they were never ill.
Dad also collected for Littlewoods football pools and had a large round. which meant he kept in contact with many people. It was a sad day in February 1993 when Dad passed away at almost 80 years old. Mum passed away January 2011 at 97 years old. 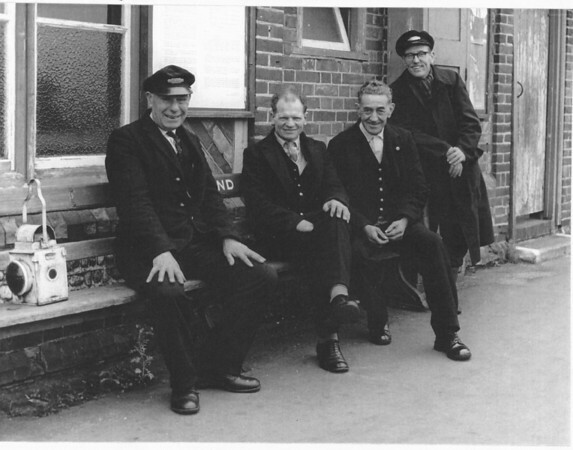 Station staff photograph – Person on far right is actually Herbert Brooks, relief signalman from July 1963. He replaced Harry Watkins following two ‘run through’ incidents (locomotive passing through points that were incorrectly set, damaging the locking mechanism). Herbert decided to stay on, although his shift had finished, because this was the last day of public operation. A very interesting article, thank you for posting it. I was interested in the old BBC series as it sounded like there may have been some good footage of Hayling Station . Unfortunately most of the episoides for the Grove Family are lost and the three that exist (Youtube) aren’t the ones with the Billy in. One point concerning the road bridge Tolls. I seem to recall as a child when we travelled by car over the new bridge that we had to pay at the toll booth. I was very young but my memory of it seems very clear. Isn’t the old toll booth still there on the Langston side? The toll continued to about 1960 with the railway still collecting the toll. I am not sure about whether anything exists – perhaps langstonian could shed light on this? We intend to contact the BBC to see if the episode is still available. In the 1950’s footage was recorded then erased and reused. I do hope the Billy episode still exists.